If you love cats, and you have one at your home, you would need to buy them a good place to take a nap. After all cats love their sleep and giving them the best bed will give them some great time. After they have eaten some of their cat food the best thing they like to do is take a quick nap. Cat beds are often with soft materials and good looking too. Focusing on being as cozy as possible. They are affordable and easy to move around and clean and they are good places for your pet to nap. Comfortable cat beds are soft, and made with good materials. This cat bed is made of soft material, it is comfortable and good looking choice. The bed is not one of the cheapest but definitely not the most expensive one. It has great cover and the raised sides are great for when your cat is sleeping or just taking a nap creating a cozy place for it. Because of the raised walls it is good option for smaller cats. There is non-skid backing that is great if you want to place the bed on hard surfaces. The bed is also machine washable. The Aspen pet bed is great option for cats. they want to take a nap especially as they prefer boxed beds. The price is good too. The bed is not too big, it is about 19″. The bed is comfortable and can keep your pet warm. The bed is made from faux lambs wool plush with non-skid bottom. It is especially designed in such a way that reflects the pets own body heat in order to keep them even more comfortable, cozy and warm. This pet tent is great for cats. It is affordable. It is made with soft materials, with faux suede, with soft poly-foam lining. The design is great as it is not your usual cat bed. It looks like a tent. 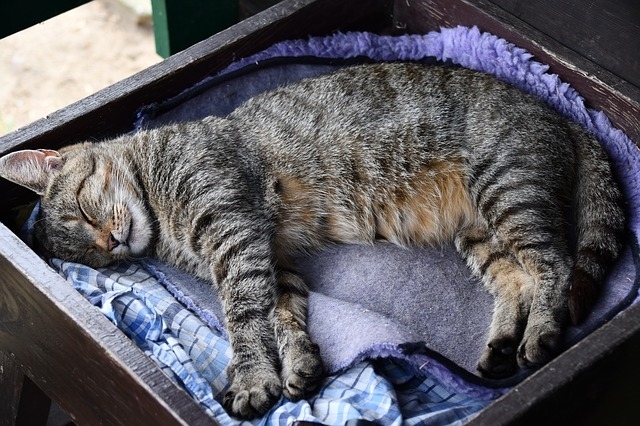 The bed is comfortable for cats as it is providing them with a sort of a enclosed space and we all know how much they like to get into tight areas. It is 16 x 16 x 14 inches and the bed is machine washable. The materials with which the bed tent is made are comfortable and good looking and not to forget the removable pillow that will make their sleeping time a breeze. The ZEN DEN cat box bed is great place for cats to sleep. It has the interesting shape than the rest witch are more of a standard beds. It is comfortable insides to make your cat feel comfortable and cozy. It is a bit more expensive than the other cat beds but nonetheless it is a great option. The bed is stylish and easy to set up. It is easy to move too. It comes with handles to make it easy for you to move it. It is easy to assemble and it can be folded. The bed is 15″ x 15″ size. Overall a great cat bed if you wish to give your pet some peace of mind where they can enjoy their time in a cozy little space. The MidWest pet bed is another interesting option. It is great for cats especially if you are looking for something more simple and minimalistic for your cat. It is fully machine washable so there’s no need to worry about how to keep it clean. It is comfortable and 22″ in size.